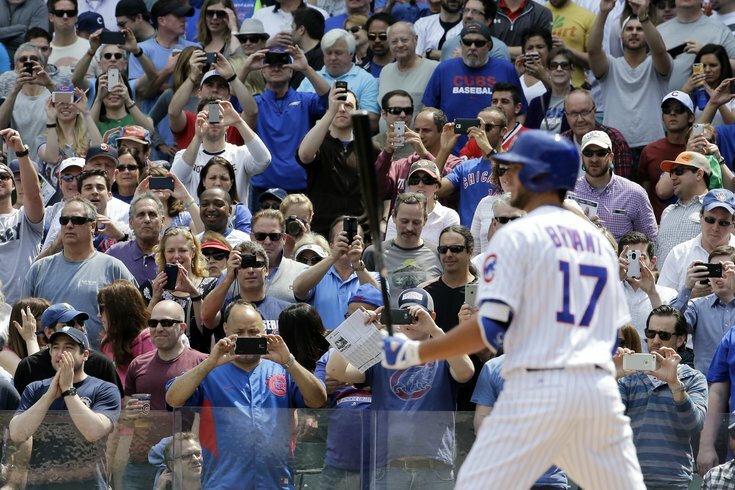 Baseball fans take photos as Chicago Cubs' Kris Bryant makes his major league debut Friday in Chicago. CHICAGO — Kris Bryant absorbed the sights and smells and sounds of Wrigley Field. He cherished playing in front of 30,000 charged-up fans. He appreciated all the family members and friends who turned out for his big league debut. Only two things were missing — a hit and a win. The prized power prospect of the Chicago Cubs struck out in his first three at-bats against James Shields and then grounded out in a key spot Friday during a 5-4 loss to the San Diego Padres. "Sure, I could have done a little better," Bryant said. "There's two sides to the ball, I felt I did well on defense." Called up one day after the Cubs ensured he can't be eligible for free agency until 2021, the 23-year-old who dominated in spring training went 0 for 4. Seeking their first World Series title in 107 years, the Cubs selected Bryant's contract from Triple-A Iowa and inserted him into their starting lineup as the cleanup hitter and third baseman. Bryant cleanly handled Derek Norris' sharp grounder in the first inning and started a double play. After a two-out walk to Anthony Rizzo in the bottom half, Bryant drew a standing ovation as he came to the plate. With fans still on their feet and taking picture, Bryant swung through three pitches for an inning-ending strikeout. Bryant fell behind 0-2 when he led off the fourth, worked the count full and then swung over another changeup. "He's a good player," said Shields (2-0), a former All-Star who started the World Series opener last October. "He's going to be just fine." Wil Myers' three-run homer in the seventh off Brian Schlitter (0-1) put the Padres ahead 5-4. With a runner on second and two outs in the Cubs seventh, Rizzo was intentionally walked. Bryant grounded into an inning-ending forceout. "That's the situation you want to be in and I sure hope to be in that situation again throughout my career as many times as I can," Bryant said. On the field before the game, Bryant embraced his father, former Boston minor league outfielder Mike Bryant. His dad watched from the stands next to his son's agent, Scott Boras. "Kris proved at all levels he was ready to play in the major leagues and we are very happy for him and baseball he is a major leaguer," Boras said in a text message to The Associated Press. Friday was Day 13 of the season, which means Bryant could at most accumulate 171 days of major league service. Because 172 days of service count as a year, he could have been eligible for free agency after the 2020 season had he been on the big league roster earlier. When Bryant was sent to the minor leagues on March 30 after hitting .425 in spring training with nine homers and 15 RBIs in 40 at-bats, players' union head Tony Clark said "this decision and other similar decisions made by clubs will be addressed in litigation, bargaining or both." After Bryant was brought up Friday, Clark said in an email to the AP: "nothing new to offer at this point." That stuff wasn't much of a concern to Bryant. "I sure hope I can look back on this and laugh at it 15 years from now," Bryant said. "It's all in the past." Despite his reputation with the bat, the best part of Bryant's debut was his glove. He was flawless in the field and, at least for one day, quieted doubts about whether he should stay at the position. "We did bring him up for his glove, didn't we?" manager Joe Maddon quipped. "He had a really good game at third base. Really played well over there." Chicago third baseman Mike Olt was put on the disabled list Friday with a broken right wrist, a move retroactive to Wednesday. Cubs president of baseball operations Theo Epstein said Bryant would not have been called up if Olt had been able to play. Epstein said the Cubs would have preferred Bryant's debut to come on the road. "We would have done it a little bit later," Epstein said, "but you can't script everything out in baseball." Bryant, selected by the Cubs with the second overall pick in the 2013 amateur draft, joins a young core that includes Rizzo, Jorge Soler and Starlin Castro. "We're excited for Kris and his family and for the organization," Epstein said. "It's a great day and we hope the start of something special."